Because of an ecological disaster along the coast of four Central Vietnamese Provinces, several hundred families face hunger. The major source of each family’s food and the livelihood of most of the men who work as fishermen – the ocean – cannot now yield edible food. As usual, the children are the first to suffer and the ones who suffer most. When Orphan Voice and Danang International Fellowship learned of the plight of the 864 worst-affected families, we acted. Last Thursday, tons of rice and thousands of instant noodle meals were delivered to these worst-hit families. And more, the food was delivered with a testimony to the local government. Your gifts have rescued the families from immediate suffering and deeply affected the government officials in charge as they witness our love in action. 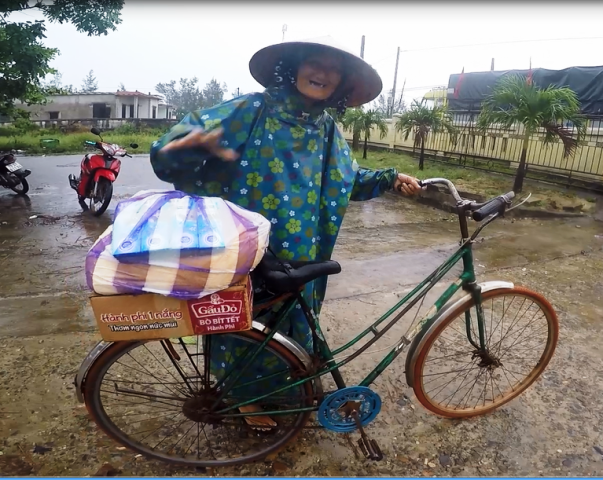 We need your help to continue reaching “the least of these” in Vietnam. Can you help us today? To support this continuing disaster relief work, Donate Here. Or mail your support to Orphan Voice, P.O. Box 910410, Lexington, Kentucky 40591. THANK YOU! Above – Hard-working crew shows love in action. Below – Happy Food Recipient!